Avoid the neutrals for a change and pick something you LOVE! If you’re anything like me your home is filled with various shades of white, taupe, and grey. Your kitchen cabinets are most likely white or a variation of brown and your flooring sticks to this neutral color palette as well. Take a step with me and choose something different…choose color! As spring arrives and color comes back into nature we suddenly feel our spirits begin to lift. What a perfect time to bring more color into our homes. A bright and cheery room can help encourage creativity every day and welcome guests with open arms. Gravitating towards blue? It's the color of trust and can signify loyalty and integrity. In love with red? Red is a strong color that usually signifies taking charge or being passionate about interests. Yellow is optimistic and cheerful which is no surprise to us. Just looking at this soft yellow sofa makes us smile. 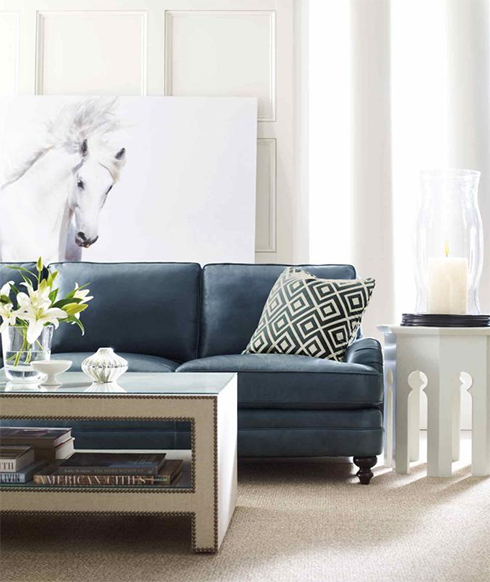 If an overall bold colored sofa is a bit too much for you, try opting for some colorful accents. Pillows, accent chairs, and ottomans are a great way to incorporate color. Think of these pieces in your room as the tie or socks of a man's suit; the colorful finishing touches may finish your look perfectly. When using color throughout your room consider the proportions of the items you're choosing. This room chose an over-sized accent chair in a fun blue color and coordinated sofa pillows and a large ottoman in the blue as well. Bright teal and purple pillows make this tufted back sofa pop. The Bernhardt Chair in the coordinating teal fabric helps balance the room and a small teal ottoman stool under a desk in the corner is the perfect finish touch. Emerald green was the 2013 color of the year but it's still trending in home decor. This bold color featured in wall art, sofa pillows and accent chairs creates a balance and positive energy within this room. Pinks aren't only for little girls' rooms! Representing unconditional love and nurturing, this color is a great option for a family room or living room furniture. Have fun with accent chairs in a variety of colors and fabrics. These Sam Moore chairs feature custom choices for fabric and wood finishes. With hundreds of sofas and chairs On Display with endless options for customizing fabrics, visit Belfort Furniture's Furniture Campus. Conveniently located in Dulles, Virginia, Belfort's furniture showrooms are filled with knowledgeable staff to help guide you through the options and your furniture selection process.